The process is simple enough, combine all the ingredients above stirring well. Let sit at room temperature about 2 hours so all the flavors fully develop and get to know each other. In the photo above the colorful “crackers” are shrimp chips also purchasable at an Asian market. 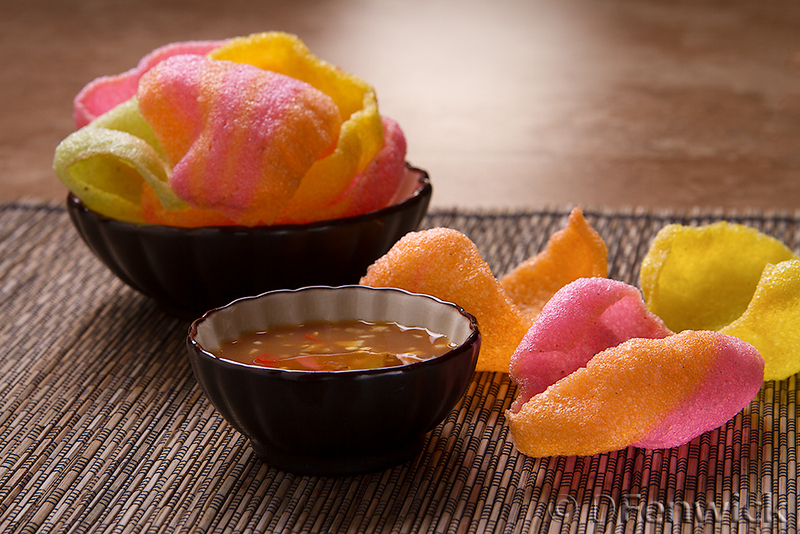 Made of shrimp paste, tapioca flour and water, these chips are dried to a hard almost translucent consistency, the frying process in your kitchen puffs them to the wonderful little crispy treats you see above. Well worth the time believe me! But if you’re not into shrimp chips, this lovely sauce can be used with wontons, egg rolls or anything else in your snackie go-to list that serves as a conduit for an Asian dipping sauce. As that little “shrimp” of a kid Mickey used to say, try it – you’ll like it!